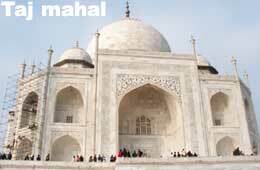 The Taj Mahal was built by the fifth Mughal emperor Shah Jahan in the memory of his beloved wife Mumtaz Mahal. She died in childbirth while accompanying her husband to Burhanpur to control a rebellion. The Taj Mahal was the outcome of the one of the four promises that Mumtaz Mahal extracted from Shah Jahan while she was alive. Taj Mahal symbolizes eternal love of a man for his wife. The body of the queen was buried temporarily in the Zainabadi Garden in Burhanpur and moved to Agra after six months. 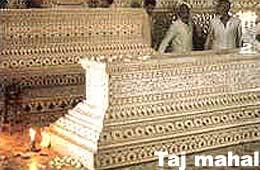 The land on which the Taj Mahal was built was acquired from Raja Jai Singh. The construction began in 1631 AD and completed in 22 years. 20,000 labors and artisans were employed for the work. The material for the mausoleum was brought from all over India and central Asia. The Iranian architect Ustad Isa designed the structure. The Taj is situated 900 ft away from the entrance gate at the opposite end of the garden. The tomb is built over a marble plinth, which rests over a high sandstone base. Four tapering minarets on the four corners of the marble plinth flank the tomb. The minarets rise to a height of 138 ft and are crowned by with eight windowed cupolas over the marble plinth. The main building is built of marble and is square in plan with chamfered corners. Each side of the corner has an iwan adorned with calligraphy. There are small rectangular double arches one over the other on both sides of the iwan. The arched alcoves of equal sizes at the angles of the tomb are semi-octagonal. The pilasters demark each section of the façade on both side, which rises from plinth of the tomb up to the frieze and are topped by beautiful pinnacles with lotus buds and finials. The central chamber is octagonal in shape. The height of the hall is 80 ft from the pavement to the side of the interior dome. The crowning glory of the mausoleum is the bulbous onion-shaped double dome. The height from the base of the drum to the top of the finial is 145 ft. The dome provides a desirable and harmonious ceiling to the inner hall and present a majestic and stately effect from outside by giving the desired height. Four small kiosks around the dome reduce the severity of the perpendicular stress. The jewel-laid cenotaph of the queen lies within the dome. The cenotaph of the emperor was built beside the queen in 1666 AD upon his death. The cenotaph of Mumtaz is in the center while that of Shah Jahan's is on the west side of the enclosure. Pietra dura inlay work decorates the marble surface of the screen and the cenotaphs with various motifs like flowers, delicate arabesques and superb calligraphy. The red sandstone was quarried from local quarries and marble was dug from the hills of Makrana in Rajasthan. Nephrite jade and crystal was brought from Central Asia, turquoise from Tibet yellow amber from Burma, lapis lazuli from Badakshan and chrysolite from Egypt. Some of the rare shells, coral, and mother-of-pearl were taken out from the Indian Ocean. Forty-three kinds of gems including topaz, onyx, garnet, sapphire and bloodstone were used in embellishing the Taj Mahal. The marble was transported through a ten-mile long ramp of packed earth and placed by an elaborate post and beam pulley. The tomb was the first building to be constructed. The mosques on the two side were erected the next, then the four minarets and lastly the gateway and the auxiliary buildings. The Taj is entered through a massive gate that opens to the south. The gate symbolizes an entrance into the paradise and represented the transition point between the outer world and the inner world. The 150 ft wide and 100 ft high gate is made of red sandstone. The gateway has a series of eleven attached chhatris with marble cupolas flanked by pinnacles above the central portal on the north and south sides. The door at the base is made of eight different metals and studded with knobs. 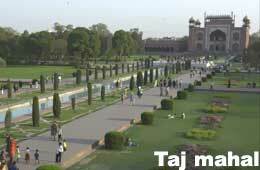 A green carpet of garden runs from the main gateway to the foot of the Taj laid in the Persian Char Bagh concept. Two marble canals studded with fountains and lined with cypress trees symbolizing death cross in the center of the garden dividing it into four equal squares. The fountains and canals provide the reflection of the Taj. The mausoleum, instead of occupying the central point unlike other Mughal mausoleums, stands majestically at the far end just above the river. On either side of the Taj Mahal are buildings of red sandstone. The one to the west is a mosque, which faces towards Mecca and is used for prayer. There is a small stone enclosure along the western boundary wall of the Mosque. The structure, measuring 19 ft by 6.5 ft is the site where the remains of Mumtaz Mahal were buried when first brought to Agra. On the east side of the Taj stands the twin of the Mosque, a parallel structure also made of red sandstone, referred to as the jawed, or "answer". It was built to counterbalance the mosque and preserve the symmetry of the entire design on the platform. The Taj Mahal is immortalized as the 'Monument of Love'. It is one of the most photographed monuments in India. It is in the list of UNESCO's World Heritage Site. Tourists from world over come to have the glimpse of this monument.